Pick the flower type and flower color that best suits your floral design aesthetic. Choosing your color coordinated bouquet of flowers is so simple at FlowerFresh, all our flower arrangements are sorted by color, so you can pick your favorite color with ease. Our floral design team is constantly creating new eclectic fresh flowers bouquets to suit every occasion. 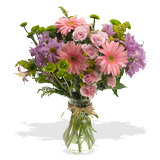 All of our bouquet of flowers are made with love and care and we send all our bouquet of flowers via FedEx to ensure timely fresh flower delivery.